CAN I ORDER MULTIPLE THINGS AND RETURN WHAT I DON'T WANT? Sure you can, but have you considered ordering a Fabric Sample first? As we make every product to order, placing a large order could delay your order. If you simply want to check colour or pattern, we recommend ordering fabric samples. We can usually get samples to you within two days and you then don't have the hassle of having to return goods you no longer want. Items must be unworn and in new condition. Items must be returned with all product packaging in re-useable condition. If product packaging is not returned, or re-useable, you may incur a £2.00 deduction from your refund. You have 14 days to request a return via our online returns form, and then an additional 14 days to return the items back to us. The following items cannot be returned for a refund: Gift Vouchers, Swatches/Fabric Samples, custom orders, customised items, Mystery Boxes. Socks may only be returned if they are unworn and in re-sellable condition. We don't offer an exchange policy. Unfortunately, we do not offer exchanges. You will need to return your items for a refund and place a new order. If you need assistance with this, Customer Services will be happy to help. WHAT IF I'M OVER THE 14 DAYS TO REQUEST A RETURN? If you have missed the 14 day limit to request a refund, we might offer store credit in the form of a digital gift voucher. This offer will be made at our discretion and is not automatic for all orders outside of this date. We will only offer this to customers who can still return their items to us within the total 28 days. As this rule is not covered by any consumer laws or regulations but is simply our way of reaching a compromise, we maintain the right to remove or revoke this offer at any time. If you are over the 28 days, I'm afraid it is too late and we will not accept your items back for reimbursement. If you are returning goods from a country outside of the European Union, you must clearly mark "RETURNING GOODS" on the parcel. Failure to do this could result in Mrs Bow Tie receiving a customs charge, which will be deducted from your refund total. Your refund could also be delayed by up to 6 weeks if the parcel is held by the UK customs office. If you are a customer outside of the European Union, your order may face customs charges/ import duty upon entry into your territory. Every country has a different threshold for importing goods, and it is your responsibility to understand these thresholds and costs before ordering. Payment for these charges are your responsibility and Mrs Bow Tie will not pay for any import charges. If you refuse to accept charges imposed on your order, and FedEx charge us to get the items back, we will deduct the cost of this return postage from your refund value. In some cases, this may be the full amount of your original order. If the courier attempts to deliver your order, but is unable to do so for any reason, they may hold your order at a local depot or collection point. It is your responsibility as the customer to collect your order or arrange a redelivery. If you fail to do so, and the order is sent back to us, you will not be refunded the original delivery cost, and the FedEx charge that Mrs Bow Tie has needed to spend to have it return will be deducted from your refund. If you wish for us to send the order back to you, you will need to repay delivery costs for us to send the order back to you again. Issuing a chargeback with your bank for anything other than fraud is a criminal offence. The chargeback procedure is designed to help people who have fallen victim to fraudulent transactions, not as a means of getting your money back when a refund is denied or disputed, or an acceptable response to facing import duty. When a chargeback is issued against us, we will pass on the delivery address details to your local authority to be investigated. 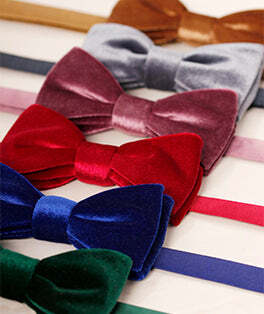 Mrs Bow Tie may appear on your bank statement as Threadster Limited. The following policies are to ensure that your shopping experience with Mrs Bow Tie is fair and proper. The terms of these policies do not affect your statutory rights and are included in our full terms and conditions. If you have any questions, please email us at support@mrsbowtie.com. We will gladly refund merchandise in accordance with the United Kingdom's Consumer Contract Regulations (June 2014). The merchandise must be unworn, unwashed, unaltered, undamaged, and have all tags attached and intact. Bespoke or made-to-order items are non-returnable and non-refundable unless they are of poor quality, such as a manufacturing fault. If you wish to claim that products you have purchased are faulty you must do so within 28 days of ordering from Mrs Bow Tie. If your product is deemed damaged or faulty we will offer you a repair, exchange or a refund as appropriate, in accordance with your legal rights. General wear and tear, damage or colour changes that occur with usage or improper storage will be your responsibility, not the fault of Mrs Bow Tie. Please follow the care instructions provided with your items and if you have any questions, please contact us at support@mrsbowtie.com. Under the ‘Consumer Contracts Regulations’ (June 2014) customers are entitled to cancel their order (thereby requesting to return) within 14 calendar days of receiving their goods. Refunds will not be issued before receiving the item(s), and can take up to 10 working days to be processed once received. We will refund the price of the goods in full. If you do not return the product packaging in a condition considered re-useable, or at all, you will incur a £2.00 fee for each packaging (this does not refer to the external postage packaging). Customers are responsible for the cost of returning any item(s) to us, unless faulty or otherwise agreed by the company. It is your responsibility to ensure that reasonable care is taken and the goods and any packaging are sent back to us in the condition in which they were received. If not, you may not be entitled to your full refund. Orders that have attempted delivery but are unsuccessful or rejected will forfeit refunds for shipping costs. All orders are sent with tracked shipping, and the details of this tracking will be used as proof of status. As all parcels require a signature upon delivery, couriers will often find a suitable alternative person to sign on your behalf, including but not limited to; a neighbour, or a work colleague or receptionist at your workplace. If you live in a building of multiple occupancy that is not easily accessible, or has a concierge, they will often seek someone else to sign on your behalf. By placing your order with us, you accept and understand these terms & conditions. Any delivery disputes or complaints must be raised with us within 14 days from the date of dispatch. All refunds must be returned with the same method of payment used, including specific credit or debit cards and accounts. We cannot, and will not, refund monies to an alternative method of payment. If your return does not meet our returns policy in any way, we have the right to deny your refund. If your refund is denied, it is your responsibility to get your items back and Mrs Bow Tie will not pay to send the items back to you.